I went to San Francisco on business last week and took a break from eating to live...although I did try to stick with vegetarian! One of my favorite taco spots is Taqueria Cancun recommended to me by my good friend Leo. Not only is this spot cheap, it's also has some of the best burritos and quesadillas I have ever had. Their meats are all slowly cooked to perfection. Jess and I went here when we were in SF together last year. I have pretty much been thinking about going back ever since. Above is the Vegetarian Burrito Mojado aka "the Big One". The inside consists of your choice of meat, rice, beans, onions, cilantro, and salsa. 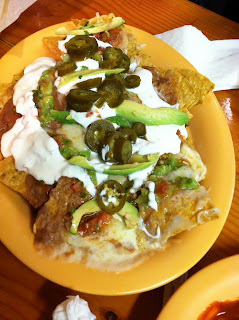 On the outside, it is topped with enchilada sauce, guac, melted cheese, sour cream, and Mexican salsa. Of course that means you need nachos as a side. Tortilla chips, refried pinto beans, jalapenos, fresh avocado slices, salsa, and sour cream drizzled on top is a great way to end dinner. Next time you're in San Fran, check out the mission!